A refugee boy's determination to ride a bicycle leads to an unexpected friendship. Joseph wants only one thing: to ride a bike. In the refugee camp where he lives, Joseph helps one of the older boys fix his bike, but he's too small to ride it. Joseph and his mother travel to America, where everything is strange and new. One day, he spots a red bike that seems just right for him It belongs to a girl with a whoosh of curly hair. When Whoosh crashes her bike, Joseph offers to fix it. His big chance has finally come, except that Joseph doesn't know how to ride He crashes a few times, picks himself up, and tries again, until suddenly, with a shout of triumph, he's riding the bike. Inspired by the author's interviews with refugee children from Sudan, this gentle story evokes the experience of a new immigrant. Vibrantly colorful paintings bring a warm and humorous portrait of friendship and diversity to life. 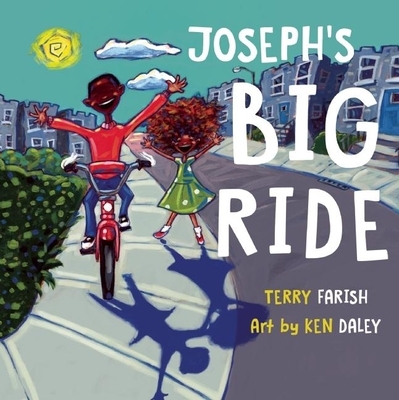 Terry Farish is a writing teacher and author with a passion for telling the stories of people from many cultures. Her novel The Good Braider was named a YALSA Best Book of the Year and selected as an American Library Association Outstanding Book for the College Bound and Lifelong Learner. Her second novel, Either the Beginning or the End of the World, will be published in 2015. Her previous picture book, The Cat Who Liked Potato Soup, won a BCCB Blue Ribbon award. She lives in Kittery, ME. Ken Daley was born in Ontario to parents who emigrated from the Dominican Republic. He draws inspiration for his painting in his African-Caribbean roots. His artwork has been exhibited throughout North America and featured in many print publications. He lives in Macomb, IL.